In this chapter Cecil shares about the kind of books he enjoys reading and the topics he is drawn to as a writer. He says, "I figured out something else about myself through my reading." He goes on to say, "More recently, I gained insight on the kind of adventure books I chose. I rarely read novels about nuclear destruction of the world or a programmed computer that, if unchecked, would destroy the economy of developed nations." Intimate thrillers and action-suspense stories also interest Cecil . He shares, "I also like defined characters. I want to picture the males and females, and I like it when the heroes aren't six-foot-six but more average like the rest of us, and the same with the females. Sure, I want her to be pretty, but she doesn't need to look as if she should be on the cover of Vogue. What does this say about me? Intimacy is the first word that comes to mind. The more I get into the heads and hearts of the major characters, the more satisfying it is to me. and it's easier for me to identify with average people." Cecil goes on to say that out of all the different genres and books that he has either written, ghosted or collaborated with, the theme that he feels has impacted him the most are the underdog stories. Examples such as Gifted Hands and Think Big are the two books that Cecil wrote for Ben Carson. Another message that comes out of Cecil's books is the topic on caregiving. He writes, "Caregiving implies emotion, transparency, and openness to hurting readers. When I focus on one of those topics, my emotions come to the surface." I have to say I share similar likes in both my reading and writing style and topics, I love to read true stories about people finding wholeness after a trail in their lives and I root for the underdog whether it is in a movie or a novel. When I write, my desire is to bring hope and healing to a hurting world. I believe in the message of freedom, grace and giving encouragement to who ever may be in need. I attempt to do this through sharing personal stories or using life experiences dealing with issues of the heart. Another style I enjoy is using the Living word from the Good News Gospel. I like using our five senses when writing with the hope of bringing the readers into an emotional experience and touching their hearts. I have read where if we can capture that reader's heart it will have a greater impact on them and they are most likely to remember the message long after the story or book is finished. Cecil finishes off this chapter by saying, "If you are free to expose yourself, and I identify with your risk-taking, you win. I also win because I become a better writer." 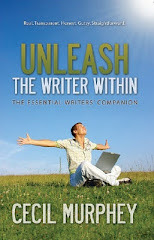 The Aphorism for this chapter is: "I learn from other writers. I grow my voice by paying attention to the writers I like to read." Aphorism # 15: "I learn from other writers. to the writers I like to read."